David Leadbetter--who has taught some of the brightest stars in golf, including Nick Price, Ernie Els, Charles Howell III, and Michelle Wie--is known and admired for his superclear, superefficient style. His tips are enjoyed throughout the golf world (and are the subject of his very popular monthly column in "Golf Digest" magazine). 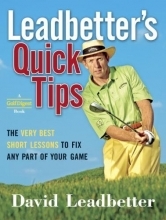 Truly representing the "best of the best," "Leadbetter's Quick Tips" encapsulates all the time-tested, straightforward advice that has long been available to the pros and avid golfers. Leadbetter, the master teac her, demonstrates invaluable tips for: - Longer and straighter drives- Consistency from the fairway- More accurate iron play- Better bunker shots- Making more putts With lavish yet clearly presented photographs and illustrations, "Leadbetter's Quick Tips" is the one book any golfer will want to have.